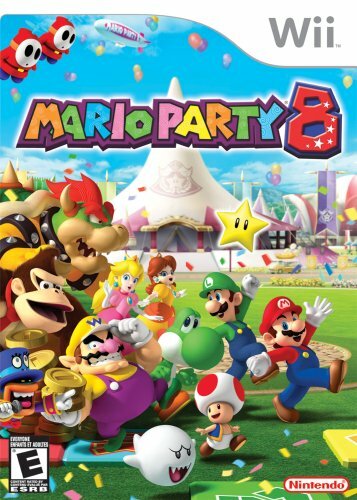 As the title suggests, this Mario Party 8 (2007) is made for more than one person and fast paced fun. It would be nice to have turn off/skip options on the help menus and cut scenes. This noticeable issue slows down the flow, which grows to mild irritation. Younger players, the target audience of these assistance arrays, will encounter frustration as well, but enough of the tried and true successful elements of this series keep the party going fairly well. The board game-based standard for the series utilizing the Wii Remote fairly well, however there’s room for innovative improvements. Players carefully tip the remote for a familiar circus act and hit baseballs (echoing Wii Sports’ success). Most players should be able to find a favorite, but the overall selection could use some more variety. The developers will likely come up with even more creative options for the ninth installment. This game has a solid interface full of colorful graphics, varied sounds and themes/elements similar to other successful Mario games. Players roll die to move on game boards that include character themes and an interesting real estate theme involving hotels. As with most Mario games, players must collect coins/stars everywhere they go. Players can have fun experimenting a tiny bit, but most of the gameplay involves amassing the items to advance, so while the game play is mostly linear, the random rolls add some unpredictability. The new boards and mini-games are fun and full of classic characters like Link and Fox McCloud. Familiar characters hold appeal even when the levels are fairly average. The mini-games, occurring at the end of each round, can get those competitive juices flowing, especially because of the random play where a player can win or lose big any time. Players might find frustration in these unpredictable momentum waves, but special power up candies can quickly turn the tide back, so use them wisely. There’s no widescreen viewing option, but it’s not really needed because most of the game play (a.k.a. multiplayer) occurs in split screen mode any way. A solid title for first time players of the Mario Party series, but veterans may want to wait until version 9 because there’s not enough new content for players who demand a high replay frequency. A great title if you want a level playing field for all ages (ideal for families and other groups with a large age range). This entry was posted in Video Game Reviews and tagged Games, Mario, Michael Siebenaler, Mike Siebenaler, Nintendo, Tall Writer, video games, Wii. Bookmark the permalink.